The Diocese of Covington has officially apologized to the boys and parents of Covington Catholic High School after being "pressured from all sides" into giving a statement in response to a viral video which appeared to show a group of Covington Catholic students harassing a Native American man. It became obvious the Diocese's initial statement threw these boys under the bus when more videos surfaced painting a fuller picture of the situation. The Bishop of Covington Roger Foys now admits that he was "bullied" into condemning the students and fully apologizes and takes responsibility for the "disruption" it has caused so many. "Since Saturday, 19 January 2019 the events at the Lincoln Memorial following the annual March for Life have gained international attention. Within hours we were being pressured from all sides to make a statement regarding a video clip which purportedly showed students from Covington Catholic High School being disrespectful to Native American Elder Nathan Phillips. Based on what the video clip showed we condemned the actions of students who engaged in the alleged disrespect and promised to investigate the matter," Bishop Foys' apology read. "Since that time other video clips -- some of much longer duration -- have surfaced. Once these went viral some of the very same people who had put tremendous pressure on us to condemn the actions of the students now wanted a retraction from anyone who had previously issued a statement critical of them," he continued. "Subsequently, there have been death threats to some of the students and their families. The vitriol and hateful comments on some online stories, some of them appearing on websites that purport to be Catholic and pro-life, have been beyond belief and anything but pro-life." 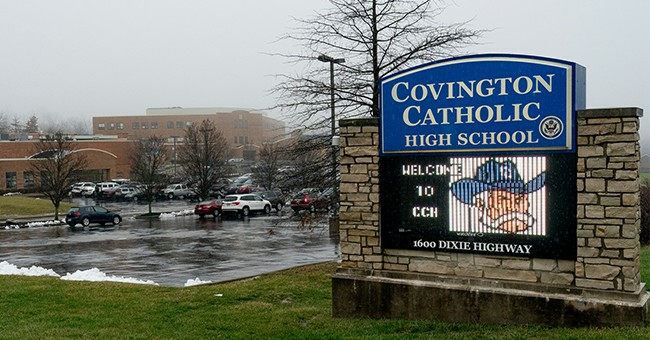 Noting that there was even a bomb scare which forced Covington Catholic to cancel school earlier this week, the Diocese lamented strangers completely unfamiliar with Covington Catholic criticizing the parents, school, and children involved in the video. Nicholas Sandmann was the central student involved in the video, who stared down the now-discredited Nathan Phillips. Sandmann has since issued a statement that despite his "smirk," he was not attempting to racially intimidate the Native American. The Bishop also reaffirmed his support for Covington Catholic's principal and implied that any hint of resignation was completely out of the question. He also called "on all those who continue to spew venom and hate to desist and instead pray for a peaceful resolution to this tragic spectacle." For the faithful, Bishop Foys asked to "pray that with the grace of God and the goodwill of all involved peace will once again reign in the hearts and minds of our faithful." Last week, in a post titled "So-Called Adults Apoplectically Overreact to Covington Catholic Kids," I wrote that the Covington Diocese "should issue a new statement and apology in support of these boys. The Church should also ask the faithful to pray for the conversion of the hate so rampant in their critics' hearts and that they use reason, patience, and wisdom instead of launching a vicious attack on children." This statement from Bishop Foys seems to suffice that request, but it is still alarming leaders of the Catholic Church could cave to public pressure so quickly as they did on Saturday.